The Senate budget by Chairman Mike Enzi (R-WY) contains an important provision to limit a gimmick often used to increase spending using phony savings from CHIMPs, which stands for Changes In Mandatory Programs. While we have written extensively about the abuse of the Overseas Contingency Operations account to allow for defense spending above the caps established by the Budget Control Act, Congress has also relied on CHIMPs to provide non-defense discretionary spending above spending limits. CHIMPs are scored as savings on paper despite often producing no real savings, but are still used to pay for real increases in spending. CHIMPs are provisions in appropriation bills making changes in mandatory spending programs, usually to reduce or limit mandatory spending. The savings are then available to be used to offset an increase in discretionary spending. This can be perfectly acceptable when the savings created are real, but it does create the opportunity to game the system. How are CHIMPs Used to Monkey With the Budget? Appropriations bills often delay mandatory spending until the following fiscal year, producing savings in the upcoming fiscal year to keep the appropriations bill within its spending allocation for the year but increasing spending in the subsequent fiscal year (often to be delayed and counted as savings again in the next year). Other CHIMPs rescind mandatory spending that was unlikely to be spent, producing budget authority savings to comply with spending limits without reducing actual outlays. In both instances, the phony savings on paper are used to offset appropriations above the normal spending allocations, resulting in an overall increase in spending. As we explained in our blog on the FY 2015 “CROmnibus” appropriations legislation, the funding bill for the current year includes nearly $20 billion of alleged cuts to mandatory budget authority that produce no actual savings. About half of that amount comes from cuts in budget authority that was not going to be spent anyway, and the other half comes from shifting budget authority from FY 2015 into FY 2016. To summarize, budget rules allow savings from CHIMPs to offset increases in discretionary appropriations above discretionary spending limits. 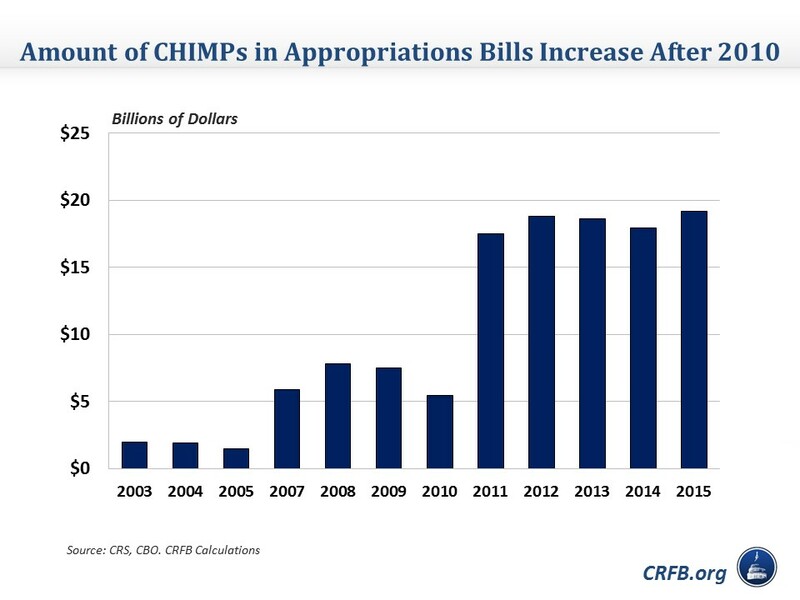 The use of CHIMPs has increased dramatically since 2010, likely to help appropriators wiggle around the spending caps established in the Budget Control Act. CHIMPs averaged $6.7 billion from 2007 to 2010, but after 2010 CHIMPs have averaged $18.4 billion. The Senate budget would crack down on the use of this gimmick by limiting and gradually phasing out the use of CHIMPs that do not produce net reductions in outlays as offsets in appropriations bills. The Senate budget would limit the amount of CHIMPs without savings that could be included in appropriations bills to $19 billion in FY 2016 and gradually reduce the amount of CHIMPs allowed in subsequent fiscal years until completely prohibiting them beginning in 2021. Phasing out the use of CHIMPs would be less disruptive for appropriations bills than immediately eliminating them and would reverse the dramatic increase in CHIMPs in recent years. The House budget currently does not contain any provisions relating to limiting or removing CHIMPs that are used as gimmicks to increase appropriations. We hope that the Senate provision will be maintained in conference committee. You can read more about this year's budget process here. For further reading on budget process provisions in the House and Senate Budgets read our blog here. For additional budget process resources including specific options for reform, visit our Better Budget Process Initiative home page.